This bracelet is hand-crafted by jewelry artisan Ying. 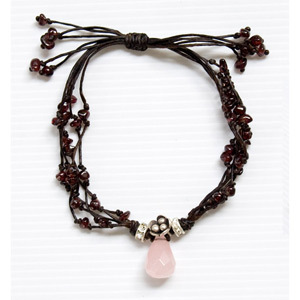 She attaches a facetted rose quartz pendant and knots a cascade of garnet on dark waxed nylon. She completes the design with silver charms handmade by hill-tribe artisans. The bracelet length can be adjusted by sliding the strings. Materials: Garnet, rose quartz, glass, waxed nylon and silver (.950).